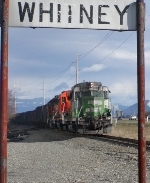 Description: BNSF's "Annie local" strikes a pose at Whitney. BNSF 2813 was rebuilt from BN GP30 2210, nee-GN 3010. Description: Southbound manifest from Vancouver, BC headed for Seattle, and running on Amtrak 513's time. Description: The "Annie Local" lays over at Whitney. BNSF 2812 is ex-BN 2812, rebuilt to GP39M from BN GP30 2206, nee-GN 3006. Description: Eastbound manifest on the Lakeside Sub passes grain elevators in beautiful downtown Sprague, WA. Description: The Conway local prepares to set out a car of plastic pellets for the Mount Vernon Terminal Railway transload. BNSF 2752 was originally Southern Railway high-hood GP30 2532. Description: Northbound coal loads on the Bellingham Sub. Description: Eastbound empty coal train descends from Stevens Pass. Description: Three Dash-9s with eastbound double stacks fly by the former GN depot at Quincy. Description: Eastbound stacks work upgrade along the Columbia River east of Wenatchee. Description: Westbound with Boeing cars first out emerges from the west portal of Cascade Tunnel. Description: An eastbound empty coal train works upgrade into the siding at Skykomish. Description: The "Annie Local" heads west, passing between grain elevators near Burlington, WA. Description: Southbound local from Burlington passes Skagit Station in Mt. Vernon. BNSF 2281 was originally SLSF 426. Description: Eastbound stacks on the Columbia River sub. Description: Eastbound stack train works upgrade around the Trinidad Loop on the Columbia River sub. Description: BNSF 2000 was rebuilt from ex-CR/PC/NYC GP40 3055. Description: The Annie local sits at Whitney with an ecletic GP40M/GP60B/GP50 lash-up. BNSF 3015 was originally CB&Q GP40 189. Description: Still wearing her original side lettering, a former BN GP50 is the trailing unit on the Annie local. Description: A bit of exotica in the form of an ex-ATSF GP60B on the Annie local at Whitney, WA. Description: A relatively unmolested ex-BN GP38-2 leads an abbreviated version of the Annie Local at Whitney. Description: Trailing unit on the Annie local, BNSF GP39E 2741 is ex-BN GP30 2223, nee-CB&Q 946. Description: A southbound freight on BNSF's Bellingham sub passes the small yard of the Mount Vernon Terminal Railway. Description: The Annie Local heads west, crossing the swing bridge over the Swinomish Channel near Whitney, WA. Description: A southbound freight on BNSF's Bellingham sub passes the south end of Mount Vernon siding. Description: A northbound Roberts Bank coal train on the Bellingham sub in Mt. Vernon, WA. Description: A southbound freight off of the Sumas Sub passes through Mount Vernon behind an "ABBA" combination. BNSF 3006 was originally CB&Q 629. Description: Snowplow decorated with the old GN mountain goat logo enjoys its summer vacation at Appleyard in Wenatchee. Description: Southbound freight with a Warbonnet leader passes Skagit Station in Mt. Vernon on the Bellingham sub. Description: The Quincy local heads east at Albus siding on the Columbia River sub. BNSF 3016 was originally CB&Q 622. Description: Westbound stack train descends from Trinidad Loop on the Columbia River sub. Description: Westbound stack train crosses the north fork of the Skykomish River at Index, WA on the Scenic sub. Description: Eastbound stacks ease out of the siding at Winton, WA on the Scenic sub. Description: The Annie local sits at Whitney led by BNSF 2826, rebuilt from BN GP30 2232. She was originally CB&Q 955. Description: The Annie local switches the small yard at Burlington. Track closest to the camera is the Sumas sub. BNSF 2352 was originally SLSF 682. Description: A westbound vehicle train drops down the grade near Foss Creek trestle. Description: The Annie local skirts the shore of Padilla Bay. BNSF 2925 was originally GN GP35 3018. Description: An eastbound empty coal train meets a westbound vehicle train at East Scenic on the Scenic sub. Description: An eastbound empty coal train crosses the North Fork of the Skykomish River at Index. Description: An empty coal train heads east at Baring on the Scenic sub. Description: Eastbound Z train approaches Sultan on the Scenic sub. Description: An eastbound Z train is reflected in a puddle while waiting for a meet at Gold Bar on the Scenic sub. Description: Eastbound Z train crosses the North Fork of the Skykomish River at Index on the Scenic sub. Description: Eastbound Z train crosses the South Fork of the Skykomish River at Grotto on the Scenic sub. Description: Eastbound Z train at Skykomish on the Scenic sub. Description: A pair of SD70MACs shove on the rear of an eastbound empty coal train at East Scenic. Description: A southbound empty Roberts Bank coal train on the Bellingham sub in Mt. Vernon, WA. Description: Southbound freight with an ABA power consist passes Skagit Station in Mt. Vernon on the Bellingham sub. BNSF 2826 was originally CB&Q GP30 955. Description: A northbound freight on the Bellingham sub in Mt. Vernon, WA. Description: A southbound freight on BNSF's Bellingham sub at CP Logen.